Located just 8 km away from Maure-de-Bretagne and only 33 km away from Rennes, this B&B provides accommodation in a tree house with a terrace offering clear views of the surrounding area. 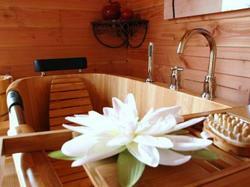 The air-conditioned room features wooden walls and a wooden bath. It is equipped with a water mattress and a kitchenette with microwave and electric kettle. A continental breakfast is served every morning at the B&B and guests can also enjoy it in the comfort of their room. Room service is provided for free. Lohéac village is just 10 km away from the property. Rennes-Saint-Jacques Airport is 26.7 km away. Guests can go for a walk in Brocéliande Forest just 24 km away or golfing at Cicé-Blossac Golf Course 21 km away. This room features a bathroom with hairdryer, a terrace and a kitchenette with microwave and electric kettle. It is also equipped with a water mattress.